These children's bathrobes are made of waffle textured fabric inside and out, and are designed for maximum comfort and durability. Woven using 100% super absorbent all natural cotton which is both sustainable and hypoallergenic. 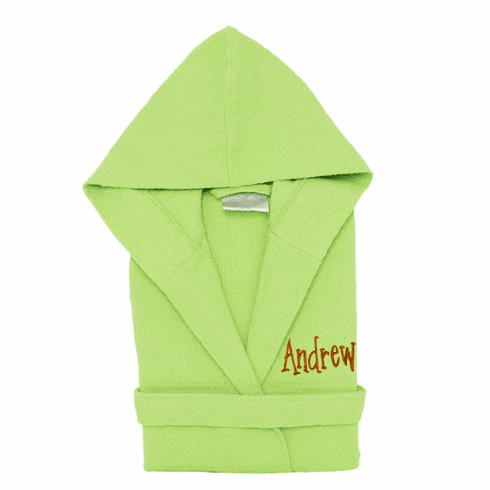 Our robes are for both boys and girls, so it would make a great gift for anyone. They are also double stitched for durability, so you never have to worry about rips or tears. Length measured from the shoulder to bottom of the robe, hood excluded. S/M 3-6 yrs	Length- 25" Width- 32"
Large 7-11yrs Length- 34" Width- 37"